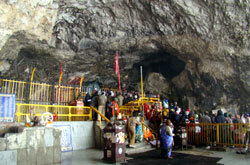 Amarnath Yatra 2011 Registration finalized. Registration for Shri Amarnath Yatra 2011 from May 10, 2011. 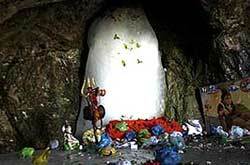 Amarnath Yatra 2011 dates - June 29 to August 13, 2011. Jammu, April 25 – The Governor, Mr. N. N. Vohra, who is also the Chairman of the Shri Amarnathji Shrine Board, took stock of the ongoing preparations for the ensuing Shri Amarnathji Yatra - 2011, at Raj Bhavan today. Among others the meeting was attended by Mr. R. K. Goyal, CEO of the Shrine Board, Mr. Preet Pal Singh, Addl. CEO, and other senior Board officials. The meeting reviewed the to date status of every item of preparation, including the planning and execution of civil works at various Camp locations and enroute to the Holy Cave Shrine, finalization of the Yatris’ Registration Process, management and operation of Langars and the telecom arrangements etc. The Governor stressed the crucial importance of ensuring timely action on all fronts and observed that he would be personally reviewing the Camps-wise arrangements in the coming weeks, visiting certain Camps as may be feasible, for that all concerned functionaries are enabled to deliver a smooth and comfortable pilgrimage for all the Yatris visiting the Holy Shrine. The Governor desired that the CEO and senior officials of the Shrine Board should forthwith fix the date, time and venue of all required co-ordination meetings, in the next six weeks, with the concerned Government Agencies and all other concerned Stakeholders, to ensure timely arrangements for the ensuing Yatra. Briefing the Governor, the CEO stated that Shrine Board had since finalized the Camp-wise Action Plans in regard to the re-erection of the pre-fabricated huts, toilets, baths and other facilities for the use of Yatris and each of these works are being taken up in the coming weeks, starting with the Base Camps. He added that on the Governor’s instructions, arrangements for the toilet and bath facilities are being substantially augmented, with over 200 additional toilet/bath units being established at various Camp locations, for making the Yatris’ stay comfortable. Referring to the first ever initiative undertaken last year, the CEO informed the Governor that the BSNL has formulated a Time Bound Action Plan for providing real time connectivity in the Yatra area, and substantially enhancing its capacity for the benefit of the Yatris and all Agencies involved in the arrangement of smooth conduct of the annual pilgrimage. Efforts are being made to ensure that the telecom facility becomes available, subject to reasonable weather conditions, well before the Yatra commencement on 29th June this year. The CEO informed the Governor that all arrangements for providing Accidental Insurance Cover of Rs. one lakh for all Registered Yatris, at the cost of the Shrine Board, had been finalized. Under this Insurance Cover, in addition to the payment of Rs. one lakh to the next-of-kin, the next of kin of the Yatri killed in an accident would be entitled to also receive a one time relief of Rs. 2500/ per child (upto two children). Further, with the support from the State Government, Accidental Insurance Cover of Rs. one lakh has also been provided to all the Registered Labour deployed during the Yatra. The Pony owners have also been provided a cover to see that, in case their horse/pony is killed in an accident the owner will receive compensation for Rs. 25,000 per animal. The aforesaid Insurance shall benefit about 20,000 Labourers and about 7000 Pony owners, all of whom belong to the weaker sections of the society. In this context, it was recalled that 42 Pony owners had benefited in Yatra 2010 when, for the loss of a horse/Pony in an accident, they were paid Rs. 20,000 per animal killed. The CEO disclosed that the Registration of Yatris procedure shall be notified in the next few days, so that the intending Yatris are enabled to finalize their Travel Plans well in time. In this context, the CEO stated that no Yatri will be allowed to enter or proceed beyond the Base Camps unless he is in possession of a valid Yatra Permit for a specified date and route. The C.E.O. appealed to all those who intend to undertake the pilgrimage to complete the necessary formalities for registration and timely obtain a Yatra Permit, in their own interest, so that no inconvenience is faced by any Yatri with regard to the date of his/her Yatra and the route to be followed. The meeting noted that as the Yatra involves trekking at an altitude of 14,800 feet, the Yatris would need to have themselves medically examined for the journey and every Yatri would be required, at the time of Seeking Registration, to self certify his/her medical fitness to undertake the Yatra. It was further noted that as the Yatra traverses through high mountains, facing strong cold winds, the Yatris would need to carry adequate woollen clothing, a small umbrella (which covers the head with an elastic band around the forehead and supported by a strap around the chin), a good wind-cheater, raincoat, sleeping bag, waterproof shoes, torch, walking stick with a proper hand grip, etc. The CEO informed that the detailed Advisory for the benefit of the Yatris is available on the Board’s Website (www.shriamarnathjishrine.com) and the Do’s and Don’ts would be printed on the reverse of the Yatra Permits. The CEO would take all necessary steps to repeatedly publicize the Advisory through the print and electronic media.